A car’s electrical system consists of the alternator, battery, starter and other components powered through the battery such as the radio, lights, etc. The alternator energies the battery through the circular movement of the engine crankshaft. The battery than provides power to the electrical components of a car. When a car is off, the battery will retains that electrical current to power the starter, ignition and fuel systems, which are responsible for creating the combustion necessary for the engine to function. The starter rotates the flywheel, that turns the crankshaft and starts moving the engine pistons. This form of electrical system is called a closed circuit system with the battery operating as independent power source. Current flows from the battery to the components being powered, and back to the battery through the ground attached to the car’s metal body. Most small to regular sized cars have a 12 volt battery and larger vehicles have a 24 volt battery. 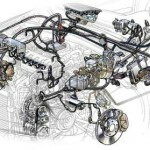 Whether it’s a lose cable, bad ground, or electrical resistance, our expert North Attleborough auto repair technicians have the knowledge and tools to perform an electrical system check to pinpoints any problems effecting a cars electrical system.